Dana Varinsky Margaret Zomzely and Sheron Tomlinson talk to Karlin Chan. 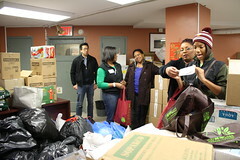 Dana Varinsky Volunteers gather supplies to distribute. Tan Suan Chang, a 90-year-old diabetic, is supposed to receive dialysis two times a week. Usually, his wife wheels him to the elevator of his building on Monroe Street and a transport service vehicle takes him to the hospital. But that became impossible after Knickerbocker Village lost power during Hurricane Sandy. Mr. Chang was too weak to walk down the stairs from his 11th-floor apartment, especially in the dark. “I didn’t want him to get into a worse situation,” said his son, John Tan. “He missed dialysis for a week so I didn’t want him to go into some kind of kidney shock.” Sunday, Mr. Tan took his father onto his back and carried him down a dark stairwell, then trudged back up for his wheelchair. He brought both of his parents to his apartment in the East Village, where they are now staying. “My father-in-law was scared. He’s fragile,” said Mr. Tan’s wife, Florence Eng. “He knows that physically he’s very vulnerable and he didn’t even want his own son picking him up and bringing him downstairs.” Ms. Eng’s mother also lives at Knickerbocker Village; she’s staying with another daughter until utilities are restored. At the moment, it’s uncertain when that will happen. On Saturday, Con Edison returned electricity to most of the Lower East Side housing complex, which houses 1,600 low- and middle-income residents, many of them seniors. But an electrical fire broke out and plunged it into darkness again. “Resulting from the fire, Con Edison imposed new power restoration procedures that govern our process and progress,” the building’s management, Knickerbocker Village, Inc., said in a statement today. Only 450 of the complex’s 1,600 units have regained electricity, and none have heat. The building’s boiler system is rare and old, making it difficult to find appropriate replacement equipment, the statement said. Margaret Zomzely, who is 104, also lives on the 11th floor. Her live-in health aid, Sheron Tomlinson, has been trying to keep her warm and fed despite the challenges. She boils water on the stove and occasionally turns on the oven to heat the apartment. In the evenings, she burns candles. During the week before running water was restored, Ms. Tomlinson carted gallons of water up and down eleven flights of stairs so she could flush the toilet, keep Ms. Zomzely clean, and wash dishes. Hamilton Madison House warming center. 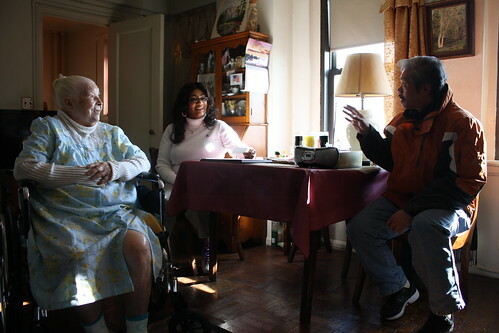 Typically, Ms. Tomlinson is relieved once a month by a temporary caregiver so that she can return home to the Bronx, but she chose to forgo her visit. “It would be unfair for me to leave her with someone else, with a replacement, in this situation. She would be more comfortable with me,” Ms. Tomlinson said. But she doesn’t think she can put up with the situation much longer. As her anxiety has mounted, she has been having trouble sleeping. “I don’t think I can do it for two days more. My heart is pounding just at the thought of it. It’s not that I’m not strong, it’s just that the whole thing is terrible,” she said. Today, the complex’s management has offered Ms. Zomzely the chance to move temporarily to a vacant apartment in a building that has electricity. But she does not want to leave and Ms. Tomlinson is unsure of what to do. She would have to take the wheelchair-bound woman down the stairs and up to the new apartment. The management offered to help move Ms. Zomzely’s bed, but no more. “Where am I going to sleep?” Ms. Tomlinson asked. In the meantime, Hamilton Madison House has set up a warming room for Knickerbocker residents, and is serving one to two hot meals each day. Mark Handelman, the non-profit settlement’s executive director, said the group is also working to distribute blankets, medication and other necessary items to homebound residents. “This was really an area that was devastated,” he said. Other groups have also been visiting residents and bringing food and blankets. 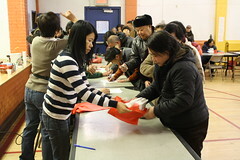 Karlin Chan, senior council at the Chinese Freemasons Athletic Club and a Lower East Side native, has been volunteering at the complex every day since the storm. He is trying to raise money to buy pallets of ramen noodles, which he says might be more appealing to Chinese residents than the Meals Ready to Eat they are currently receiving. This afternoon, New York City Comptroller John Liu stopped by to assess the situation at Knickerbocker. “People are hurting here. It’s going on two weeks at this point,” he said, promising to provide hot meals to residents this weekend and to turn up the heat on Con Edison. 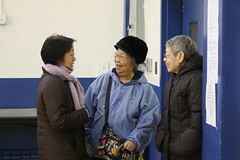 But volunteers and residents say the politician making the biggest difference is City Councilwoman Margaret S. Chin, who has stopped by the complex almost every day to help out and talk to residents. State Senator Daniel Squadron’s office also contributed, sending an emergency shipment of blankets as the weather cooled.